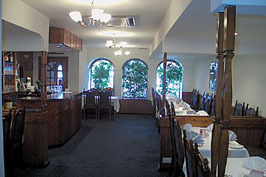 A family run restaurant with friendly, attentive service. Now open for 17 years, Dewali has an intimate relaxed ambience. Traditional Indian and Bangladeshi cuisine features on the a la carte menu with a range of fixed price meals and renowned for specialities such as Murghi Masalla (whole marinated spring chicken cooked with special herbs) and Chef’s Thali. Good Curry Guide recommended. Open every day from 12-2pm and 6-10.30pm (Fri-Sat 6-11.15pm). All major credit cards accepted (not Diners). No service charge. Traditional Indian and Bangladeshi dishes together with specialities freshly prepared.